Wigan's 42-0 win over Catalans Dragons underlined the value of Joe Burgess as his scintillating hat-trick allowed Adrian Lam's side to breathe life into their season. It is now two wins on the bounce for the Warriors, who ran in seven tries on a miserable return to the DW Stadium for former favourite Sam Tomkins. Wigan's ability to keep their opponents to zero pleased Lam just as Burgess' finishing in only his second game back from a serious knee injury, but Tomkins was booed with nearly every touch of the ball. Back in 2011, when the then 22-year-old was booed by his own supporters while playing for England against the Exiles, he said: "It's water off a duck's back as far as I'm concerned and it now won't come as a shock if it happens again." Tomkins spoke of the need for change when he headed for the south of France, describing the move as the "perfect fit", but the reaction will have hurt him on his first return back to the place he once called home. What can you say about Warrington's performance against Hull FC on Friday? The first-half dominance that was seen against Wakefield a week ago repeated itself, but whereas their performance dipped at the Mobile Rocket Stadium, Steve Price's men continued to suffocate the Black and Whites. It was a ruthless performance which underlined why they are the closest challengers to St Helens after eight matches. Such is the strength in depth at the Wire's disposal, it has been slightly surprising to witness the lull in intensity in previous matches after the break. But against Lee Radford's men, this was a complete 80-minute performance as the hosts had no answer to Warrington's relentless attacking rugby. 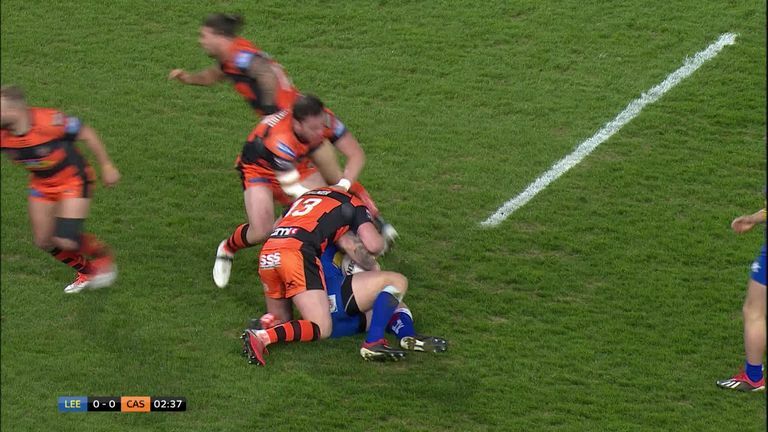 Blake Austin looks like the missing piece to the jigsaw, and continues to repay the faith shown in him, dummying his way through to four tries. But there is threat everywhere you look, and the way Hull were stretched apart demonstrated the variation that is now the hallmark of Price's side. The round started in dramatic fashion on Thursday as Brad Dwyer scored a dramatic 41-metre drop-goal in golden-point extra-time to give Leeds Rhinos victory against Castleford Tigers. It could prove a defining moment in their season. Cas were second best for long period of the first half at Headingley but they retreated kicking themselves and wondering how they lost the game. Hull KR ran St Helens close, but they now prepare to host a side brimming with confidence after snatching victory from the jaws of defeat. Paul McShane will curse his poor decision-making which he admits cost his side, but he ought not to beaten himself up too much. 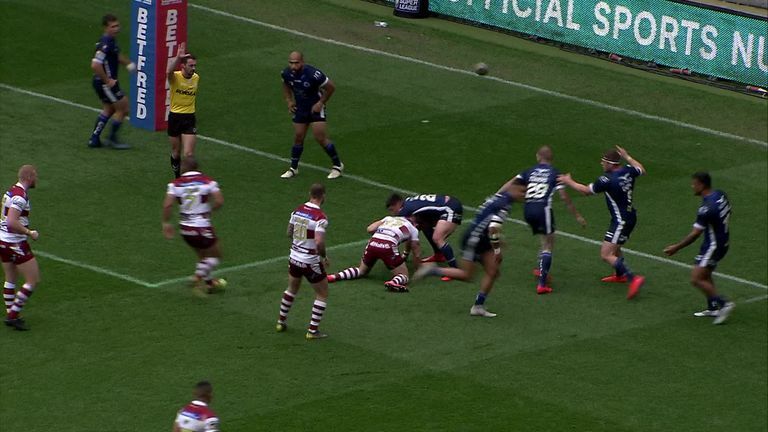 This was a topsy-turvy affair that Leeds led 20-4 with a quarter of the game remaining, but after the Tigers fought back, Dwyer settled the affair with the first golden point in front of the Sky Sports cameras. Trent Merrin said afterwards: "The footy gods carried it over! It looked like it floated the whole way over, it was crazy, but I am proud of him. He dug in for the whole game and if anyone deserved it it was him." For the Rhinos, one win will not make a season, but Dwyer's golden moment must be seen as the perfect springboard for things to come. Huddersfield are among the sides to have been severely hampered by injury in the first two months of the season with Leroy Cudjoe, Paul Clough, Aaron Murphy, Dale Ferguson and Tom Holmes among the walking wounded. But after a punishing start, Sunday brought shoots of recovery for the Giants as London Broncos were defeated 38-26. Akuila Uate scored twice as Simon Woolford's side moved up to ninth in the table. Four sides are now locked on six points, and the Claret and Gold's third win of the season was helped by a 22-point lead being established in the first half in the capital. Woolford said: "We spoke all week about coming out the blocks first and not being second in the energy and enthusiasm stakes, which London sides always have in abundance. "We've found a way to win a couple of games now, there are guys coming back so I feel that dark period we had early doors is over and we can move on from here." Huddersfield is a town in need of a lift after the football club were relegated from the Premier League, and a third straight win at Wakefield on Friday would see them continue their climb having sat rock bottom less than a month ago. We are still two-and-a-half years away from the Rugby League World Cup in 2021, but this weekend in Manchester marked a major milestone in progressing the women's game. The Rugby Football League launched its '21 by 21′ plan which aims to get 21,000 women and girls playing the sport before the country hosts the tournament. Manchester was the venue as this excellent initiative was kick-started alongside the 2019 Women's Season Launch, and it will only increase the popularity of the sport among women and girls. Ralph Rimmer, Chief Executive of the RFL said: "It's fantastic that we're launching the 21 by 21 campaign to encourage more Women and Girl's to be involved with Rugby League. "It's an ambitious aim but the growth of the Women's and Girl's game over the past few years has been huge and I'm sure everyone involved in the game will embrace, encourage and help to achieve the targets that double our numbers." The number of girls' teams increased by 35 per cent in 2018 - and the '21 by 21' campaign over the next two years will further demonstrate how the sport is on the rise.